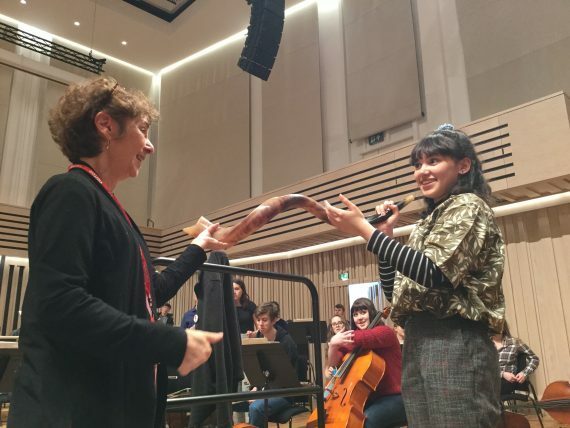 Young musicians from Chetham’s joined forces with players from across Greater Manchester and Nina Bernstein Simmons, youngest daughter of Leonard Bernstein, to celebrate her father’s centenary. Born in 1918, Bernstein wrote some of the most memorable music of the 20th century, from West Side Story to On the Waterfront. He was also a committed teacher, creating some of the very first Young People’s Concerts for broadcast across America. One hundred years after his birth, young players from Greater Manchester Music Hub and Chetham’s School of Music performed in two unique events celebrating his music and legacy. That might be particularly true for the young brass player who took up the Shofar, a ram horn flute which influenced Bernstein’s early compositions – and who received a private lesson from Nina herself in how to extract its sound! Away from Manchester, the celebrations continued. Five pianists also travelled to Leominster to perform Bernstein’s Anniversaries in their Music in Quiet Places series; and to Jersey Academy of Music where they performed alongside young singers and instrumentalists from the school and local area.